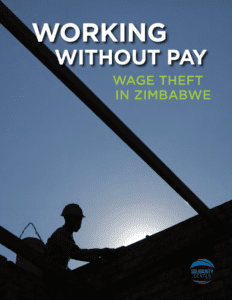 An astounding 80,000 Zimbabwe workers in formal employment—out of some 350,000 workers—did not receive wages and benefits on time in 2014, according to a new Solidarity Center report, “Working Without Pay: Wage Theft in Zimbabwe,” released today in Harare. As a result of this widespread wage theft, many workers say they are forced to eat only one or two meals a day; move repeatedly to access affordable housing; and rent two rooms or fewer for their entire family to make ends meet. 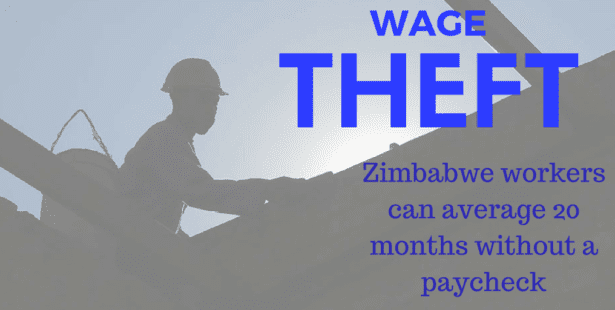 Through first-person interviews and other research by affiliates of the country’s main trade union confederation, the Zimbabwe Congress of Trade Unions (ZCTU), the report provides hard data behind last week’s successful one-day shut-down of businesses, government and services by workers across Zimbabwe outraged over wage theft and a new law targeting market vendors who make up the vast proportion of the workforce. One woman interviewed in the report, whose experience is not uncommon, says she has received $26 a month in wages for the past eight months, although her monthly salary is $342. Yet basic living costs, which on average include $60 for renting a single room, $30 for electricity, $15 for water and $22 for transportation to work, mean she only has sufficient funds to get to and from her job. The report traces the ongoing wage theft to 2012, as employers in the public- and private-sector increasingly began delaying wage payments. Simultaneously, the number of jobs in the informal economy has skyrocketed, the report points out. Some 6.3 million people made up Zimbabwe’s workforce in 2014, of which 5.9 million workers (94.5 percent) were informally employed, compared with 84.2 percent in 2011, according to “Working without Pay.” An additional 800,000 women and men were in the workforce, but unemployed. Last month, the government introduced a statutory law that bans imports of basic commodities—a law that directly affects hundreds of thousands of informal economy workers who survive on cross-border trading. Up to 95 percent of jobs in Zimbabwe are in the informal economy, and workers say the new law takes away their livelihoods. Based on surveys at 442 companies, and the result of extensive research by the Labor and Economic Development Research Institute of Zimbabwe, the report also documents extravagant salaries and benefits to middle and top management even as workers go unpaid and presents recommendations for action to address the problem. The Ministry of Labor, together with representatives of employers and unions, should review the status of companies that are not paying their workers and assist in developing plans to rectify the injustice. Unions representing workers in companies not paying salaries—in full and on time—should demand that the government bring criminal proceedings under the relevant provisions of the Labor Act against employers. Trade unions should advocate for payment of interest on late payment. The government should set an example by reviewing the wage structure in government agencies and quasi-government agencies to limit benefits to top managers, institute a more just pay scale and prioritize payments to workers through collective bargaining or social dialogue.